Only TransPak leverages the speed and flexibility of CrateMaker, our proprietary design software. 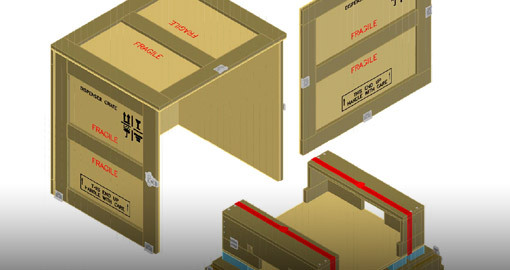 Working alongside AutoCAD, CrateMaker takes your equipment specifications and creates a fast and accurate crate spec and estimate. By using Cratemaker, we eliminate the guess-work and user error of traditional spreadsheets while calculating all the details of a new or modified crate in under a minute, which saves us all time and money. Helps improve document control to ensure the customer product is made correctly and consistently every time. Is cloud based, so you'll get "copy-exact," no matter where the crate is created. Designs are pulled right through the system to any of our many locations. Is fully IT staff-supported within TransPak. Provides superb revision control; if the packaging changes, rest assured we will build the latest current model. We can even go back and build earlier models if legacy products are needed. Simply note the style and dimensions, and CrateMaker envisions everything that's needed to create the crate, including all materials, quantities and dimensions.